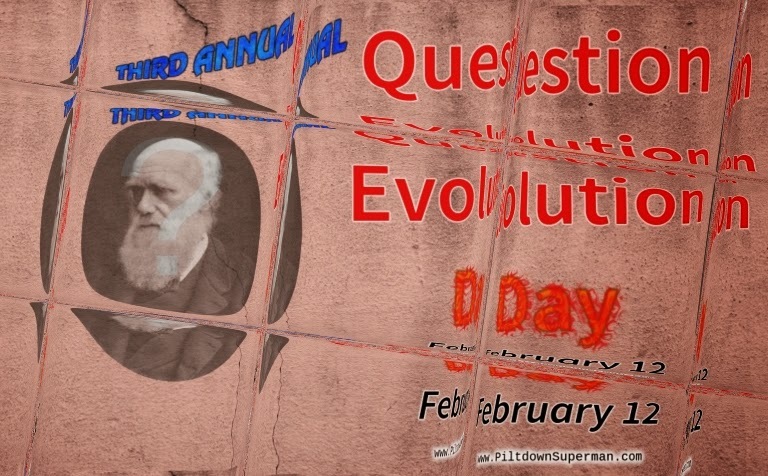 In observance of the third annual international Question Evolution Day, I am going to focus on biblical authority and worldviews. With the help of a couple of articles, of course. First of all, I do not know of any major creationist organization that says that you must believe in a literal six-day creation and reject evolution in order to be a Christian. This is not a salvation issue, but it is still important. It is my belief that most people simply never gave it a second thought, Genesis is a story but science tells us how life began and evolved, so God used evolution. Of course, they have evolution assumed to be true, are given many fancy stories that may sound plausible on the surface, and if people question evolution, they are subject to ridicule and being called "anti-science". In addition to appealing to emotion with ridicule, they also appeal to emotion by saying that "scientists agree that evolution is true", and, "most rational people believe in evolution". Those are fallacious, with appeal to emotion, appeal to authority and appeal to majority. But majority and consensus do not determine truth. There is a distinction between historical and observational science (put forward by evolutionists before creationists began discussing it). Evolution is historical science; it cannot be observed or replicated. So is creation. Both use scientific methods to support their positions. The science that can be observed and repeated (such as the stuff Bill Nye was famous for) is observational science. Supporters of evolution will equivocate (another logical fallacy), and say that evolution is science. This is a confusing, manipulate bait-and-switch technique. When biblical creationists are denying evolution, we are not denying "science". We are saying that our interpretations of the evidence supports the Genesis Flood and actually refute evolution. Creation scientists have theories and models just like their secular counterparts. There is disagreement and discussion on some — that's what scientists are supposed to do. But biblical creationists do not compromise on the Scriptures. God told us he created the universe in six literal days and that there was a global Flood. Those are not up for debate, but the science aspects are. Theistic evolutionists (God used evolution) have some serious problems. Some are blatant compromisers with disdain for biblical authority. Others have not thought the matter through. Perhaps some just do not care. I see that theistic evolution has some very serious issues and leads to a domino effect of compromise. If the creation account was a story, these people have to explain why Jesus lied to use when he said that God made them male and female from the beginning of creation (Mark 10.6), and that something was amiss with Paul when he referred to Jesus as "the last Adam" (1 Cor. 15.45). Also, if the Flood was a local event or figurative, Peter must have been confused or something when he not only referred to it as a global judgment, but likened it to the coming judgment by fire (2 Peter 3.6-7). If the Bible doesn't mean what it says in Genesis, why should we trust it when we are told that Jesus was born of a virgin, was crucified on a cross for our sins, died, was buried, and bodily resurrected on the third day? Here are two articles that I strongly recommend. First, "Why We Believe In Creation (and Not Unguided Evolution". This shows how theistic evolutionists have an inconsistent worldview, and that evolution is not compatible with the Bible. Second, "Perils of Theistic Evolution" goes into greater detail and shows how such compromise seriously undermines biblical authority and the gospel message. Do we hang our interpretations of man-made philosophies of science that are ever-changing, or do we trust what God has said in his Word?